PHILIPSBURG — Tourism Minister for St. Maarten, the honourable Stuart Johnson, traveled to Saba on Monday for several meetings to discuss the solidifying of St. Maarten’s hub function relationship with its neighbouring partner and foster joint venture marketing initiatives with the two islands. The Minister will visit other neighbouring islands as part of the strategic development plan of the Ministry of Tourism, Economic Affairs, Traffic & Telecommunication (TEATT) in collaboration with private partners who contributed largely to the overall bill for the day-trip, to discuss the PJIA hub function to the region and improve its presence as the airport looks to return to full operation with the addition of a US-Preclearance facility. Johnson told government officials on Saba and members of their Tourism Office that the Government of St. Maarten is committed to strengthening its regional hub function to support the transportation needs of the neighbouring islands. As a means of supporting Saba’s connectivity to the rest of the world, both governments will also review and address the challenges and legislation in the Maritime Industry including addressing Customs and Immigration related issues to facilitate seamless day trips to the islands that mitigate the loss of time, especially for cruise passengers. One key message from Johnson during his introductory remarks was his optimism that the PJIA Terminal Building will be back online by November as promised by the Airport’s management team. “I will continue to monitor the progress, and I expect the airport to keep me updated on all aspects of the repair work being done,” said Johnson. During the meeting at the Queen’s Gardens, Johnson said the principal fact is Saba and St. Maarten has a long-standing history of shared culture and a bond of family that transcends any constitutional change. “We have always been a family, and we have had a healthy relationship for many years, and my goal is to ensure that we can build on this relationship,” said Johnson. His delegation included representatives from the Princess Juliana International Airport, Winair, and the St. Maarten Tourist Bureau to discuss joint venture marketing and promotion efforts between the islands along with improving the hub function of PJIA. He met with Commissioner Bruce Zagers and Commissioner Rolando Wilson with whom he initiated discussions regarding Saba co-signing the memorandum of understanding that was signed recently between St. Maarten, St. Martin and Anguilla for a comprehensive ten-year Tourism Master Plan. The MOU will be the first tangible step to fostering greater communication in the area of destination promotion. Johnson also mentioned the importance of promoting Carnival-50 and beyond along with Heineken Regatta as critical attractions to the islands. The recently held lighting parade was also seen as an attraction that can be added to the yearly calendar. When promoting these events, the idea is to give visitors information about neighbouring islands such as Saba as a “two destinations for one” concept. He mentioned improving data collection to provide realistic information about interline passengers headed to Saba and the neighbouring islands to provide a stronger appeal for attracting other airlines. The meeting was also attended by Policy Advisor on Infrastructure for the Saba Government Sarah van der Horn, Island Secretary Tim Muller, Director of Tourism Glenn Holm, Policy Advisor for Saba Tourism Bureau Nicole Johnson, and Assistant Director of Tourism Desire Johnson. The group also discussed strengthening relationships between Saba and St. Maarten in the area of Marketing and Public Relations. This means selling St. Maarten as one destination with several options for day trips, maximizing efforts to penetrate the USA, Canada, Brazil, Argentina and Benelux markets. Clifton Brown, SXM Special Projects Coordinator for PJIA also spoke of finalizing the Air Service Development Committee to include Saba. Interim Director of the STB, May-Ling Chun, spoke of the progress being made in returning hotel rooms to the island’s inventory. She said that the growth was steady and already 56 excursions from land and sea including the Zip Line were back online. Businesses were reopening, including the Cost U Less outlet which is a favourite for visitors from the neighbouring islands, and 1307 rooms were back online which represents 34% of the room inventory, with an expected increase to 56% by the end of the fourth quarter of this year. Chun also gave updates on the progress on French St. Martin which showed over 189 units returning to their room inventory with the expected addition of Belmond La Samanna Resort in December. Cruise numbers were reported to be around 102,234 as of July this year and with the return of major cruise lines, the day trips to Saba and Anguilla are expected to increase. She also mentioned the return of the Sonesta Ocean Point Resort in November and Sonesta’ Maho’s flagship Resort in February 2019 as positive signs of improvement. With Winair already boasting a world Pizza Delivery record of seven destinations in 48 minutes, it is increasing its service to Saba by creating an earlier flight that allows business and leisure visitors to St. Maarten to arrive here over an hour and a half earlier. 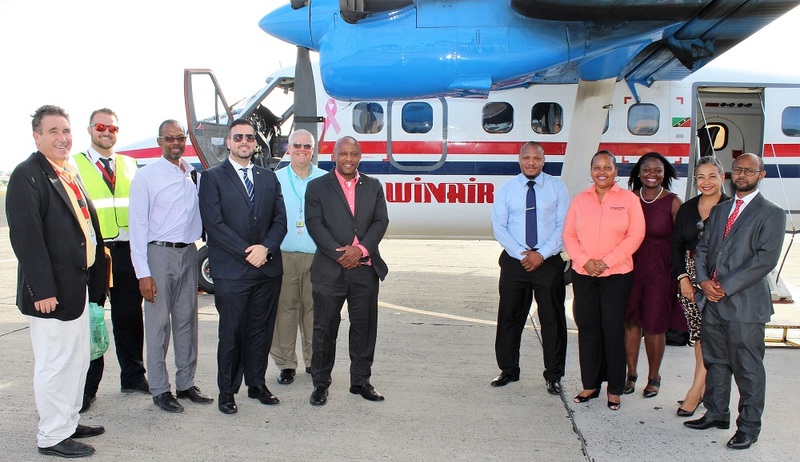 Chief Executive Officer for Winair Michael Clever said Winair continues to work on its Interline agreements with major airlines and at present can sell tickets from any destination worldwide to Saba without the hassle of going through multiple immigration and customs checkpoints. Winair maintains 11 codeshare/interline agreements with various carriers to facilitate the travel experience for our passengers and clients. Passengers with combined itineraries with our multiple airline partners and Winair travel seamlessly thru PJIAE, receiving their boarding passes at their point of origin city and checking their bags to their final destination. Winair also has special thru fares with the following partner carriers: Air Caraibes, Air France and Copa Airline. 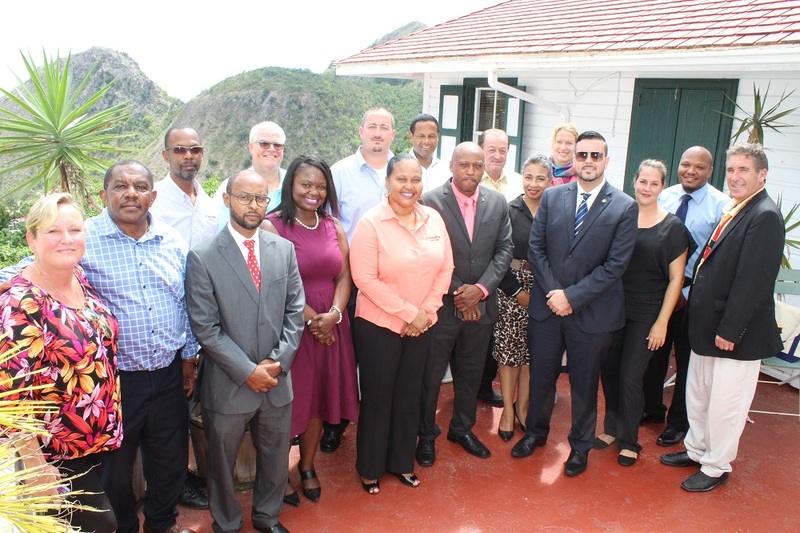 Photo caption: Delegation of Government and Tourism Ministry officials from Saba and St. Maarten at Queen’s Garden in Saba. Photo provided by the cabinet of the Minister of TEATT. Top photo caption: Delegation return from day-trip to Saba. From the left: Winair Chief Executive Officer Michael Cleaver, a Winair Pilot, St. Maarten Tourist Bureau STB Marketing rep. William Bell, Tourism Minister for St. Maarten, the honourable Stuart Johnson, VP Marketing for Winair Claudio Buncamper, Chief Operations Officer for PJIA Michel Hyman, Executive Assistant in the Ministry of TEATT Fernando Thomas, Product Development for STB Lisa Coffi, Corporate Communications Officer for PJIA Audrey St. Luce-Jack, Interim Director of STB May-Ling Chun and SXM Special Projects Coordinator for PJIA Clifton Brown. Photo provided by the cabinet of the Minister of TEATT.